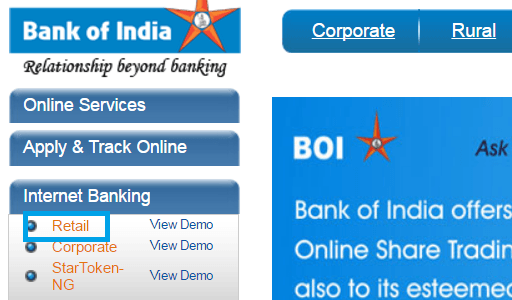 Bank of India (BOI) is one of the top banks in India. These days, transferring money from bank of India to other banks has become very easy through internet banking. Beneficiaries are added into a bank account's online interface to make fund transferring easier. 1. To begin the beneficiary adding procedure, launch a web browser of your preference and navigate to this web address http://www.bankofindia.co.in/english/home.aspx. Wait until the page loads. 2. To the left hand side of the page, there should be an Internet Banking pane with few options underneath like Retail, Corporate, Global etc. The procedure is shown for Retail accounts (normal user). Click on 'Retail'. 3. The login page for Bank of India online accounts would load. The system is also known as Star Connect. However, you should see a User ID and Password field in the left pane and a virtual keyboard in the mid-section. 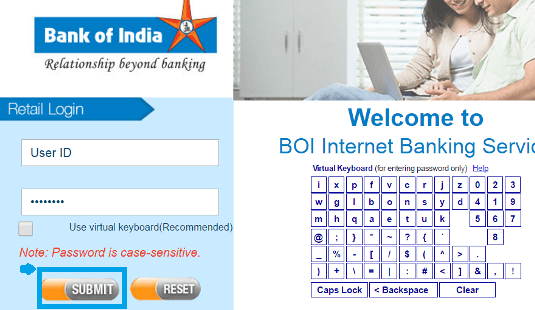 First time user Read: How To Login First Time In Bank Of India Internet Banking. 4. Click on 'transfer' tab from top menu. 5. Click on 'IMPS Payment' from the left side to add new beneficiary account. Similarly, you can also use 'RTGS payment' and 'NEFT payment' to add beneficiary. 6. Next click on 'Add Beneficiary', A new page would appear with a lot of fields. Fill up all the necessary beneficiary information asked by the bank. Once you are done, click on 'Add Beneficiary' on the bottom of the page. 7. Next enter user id and transaction password. Then approve your beneficiary by entering code sent to your registered mobile number. Your beneficiary account will be added with in 24 hours. This procedure shows how to create an online banking account in Bank of India Platform and then add a beneficiary. When I am going to add beneficiary...I am following all the steps but in the last when to ask for entering transaction password, I am filling it but always comes error. Write to comes "the user is already disabled for the transaction"
Add beneficiary a/c procedure for corporate banking. HOW DO I ADD BENEFICIARY ACCOUNT IN BANK OF INDIA WHERE IN MY BANK IS ALSO BANK OF INDIA SANTACRUZ BRANCH AND BENEFICIARY BANK IS ALSO BANK OF INDIA FORT BRANCH. TRIED A LOT BUT WHEN I PUT IFSC CODE IT SHOWS IT IS WRONG THOUGH IT IS NOT WRONG. I AM SAME PROBLEM FACE IN BANK TO BANK TRANSFER. how to add a beneficiary with a/c at laxmi nagar branch? It insists that IFSC code of BKID0006053 is wrong, and won't proceed. I know that this is correct code. Can't even find the branch name in list provided in the search for ifsc code option. How to do this? 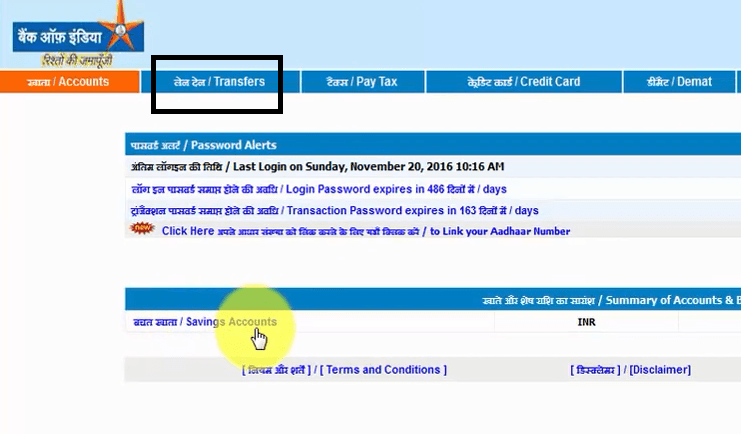 HOW TO ADD TRANSFER TAB IN BOI NETBANKING. NOT VISIBLE IN MY NETBANKING ID. but i already registered the payee. How to Add a Beneficiary in Bank of India Retail users. I am unable to see Transfer option in my net banking account. But I am unable to see Transfer option to Make a transaction. make sure u have got transfer facility or just view only. or create your own new transaction password to make it available.